Palestinians from the village of Ur al-Tahta briefly blocked route 443 to Jerusalem on Tuesday to protest the uprooting of trees. They are claiming that settlers are behind the acts of sabotage. 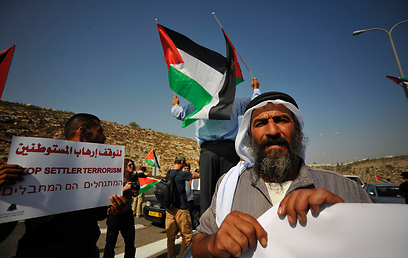 The protesters carried Palestinian flags and anti-occupation banners. Who took down olive trees? 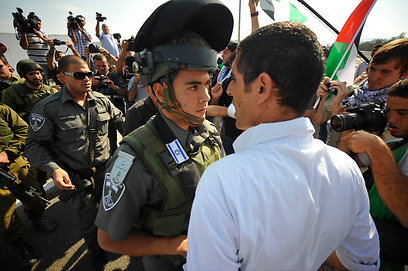 IDF forces called to the scene clashed with the protesters in an attempt to clear them from the road. They used shock grenades and ultimately succeeded in clearing the road. 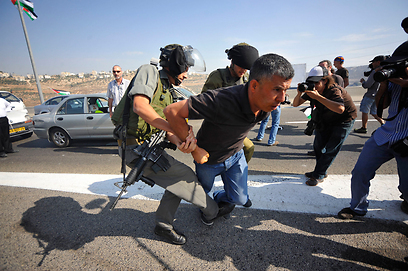 "As long as the Palestinians are being assaulted by the settlers, especially during olive-harvest, and as long as Palestinians' lives are disrupted, the lives of Israelis will also be disrupted," a member of the popular committees told Ynet. Recently, as the olive-picking season reached its height, both Palestinians and settlers were constantly filing complaints in regards to felling olive trees and robbing crops. Palestinian farmers who filed complaints on Monday, stating that olive trees in their possession were chopped down, were documented earlier as they were felling olive trees. The complainants claim that the trees they were cutting were growing in a different plot from the one in question. See all talkbacks "Palestinians block road to Jerusalem"